Q: Tell us about yourself – how long have you been a dog photographer? I would love to describe myself as a crazy dog lady - scrap that - passionate dog lover! Since early childhood I was crazy about dogs, read a lot about dogs, collected little ornaments, toys, posters, calendars, everything related to dogs. Unfortunately due to family arrangements I couldn’t have dog of my own. My father is a very keen amateur photographer and I got interested in his hobby at a very early age. At high school my photos of architecture and nature started getting recognition and being published in magazines. When I moved to London for my university I kept shooting the urban landscapes and won a few awards in travel photography. Later on I went back to my dream of having my own dog and started working with dogs, followed some dog trainers around and visited RSPCA centres over the weekends. This is how my dog photography commenced 7 years ago now. Since then I have switched completely to dogs, rarely you can see me photographing anything else nowadays. Q: Do you specialise in any particular breeds? I can’t tell if I specialise in one breed, but you do end up generating certain breeds around you. For a few years I mainly worked with Dachshunds, not just in photography, but training and walking too. Later on I got myself a Nova Scotia Duck Tolling Retriever and now you can see a lot of Retrievers and other Gundog breeds in my photos. I do love Border Collies and Papillons, but don’t catch them in front of my lens too often. As I said, I own a Toller and we spend a lot of time with other Tollers on the walks, trainings and shows. It is not a very popular breed, and minor breed owners try to stick together as much as possible. Q: What is your favourite photo that you have taken? Tough question. One of my all time favourites is a photo of a shaking Collie just out of the water; it looks very surreal because of the water drops making a certain pattern around the dog. This photo was taking ages ago, way before I got my professional DSLR. I do tend to like the water and snow photos. But I have a couple of portraits of my Toller that just leave me speechless, probably due to our very strong emotional bond. Q: Would you have any tips to offer new dog photographers just starting out? Do practice A LOT, the experience brings the perfection. Don’t be afraid to take thousands of photos and be brave to delete 90% of them, this is how it works; keep only your best ones. And bear in mind that the equipment is not the most important thing in the photo; it’s your vision and the ability to produce the right shot that counts most, even if you did it with your iPhone. Q: What’s the best thing about being a dog photographer? The best thing about being dog photographer for me is the opportunity to spend time with dogs, to feel them, to see their character and to reflect it in my photos. But also, if I have a chance and my husband is behind the camera pressing the buttons I love handling dogs at the photoshoots. 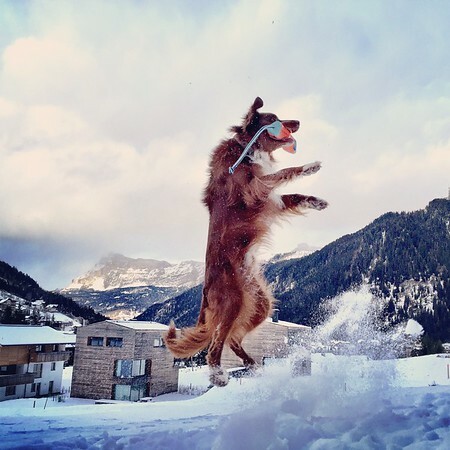 My favourite type of dog photography is action outdoor photography, happy dogs running in the fields, having fun in the water or going crazy in the snow, you can do it 24/7 all year long in any weather conditions. I do love challenge and shooting high speed action shots at agility or flyball competitions is a great challenge, all that adrenalin in the atmosphere transfers to me as a photographer as well, I enjoy that a lot! Crufts is the whole different story, it’s a great privilege to be the Crufts photographer and I love it to bits, even though it’s very demanding and you can feel the pressure constantly to get THE right shots from the competitions, another good challenge for a dog photographer and very rewarding too, especially when you see your photo on the cover of the show catalog the next year. Q: Are you working on any new dog photography project(s) that you would like to talk about? To be honest, I don’t. I’d love to, but I have never had time and motivation to do it. Maybe it is a good time to start now! One of my big passions are photos of dogs shaking off the water, I have thousands of those. Q: You take a lot of great photos with your iPhone as well. What tips would you offer to people starting out on taking photos with their mobile? Just do it! Don’t be afraid and don’t assume that photos from mobile phones are rubbish, they are not, the current technology is extremely advanced and allows you to take fantastic shots with your phones. Remember that the light conditions play a great role in your results as you have less settings to play with. Q: What is your website so people can get in touch with you?